The time is now. 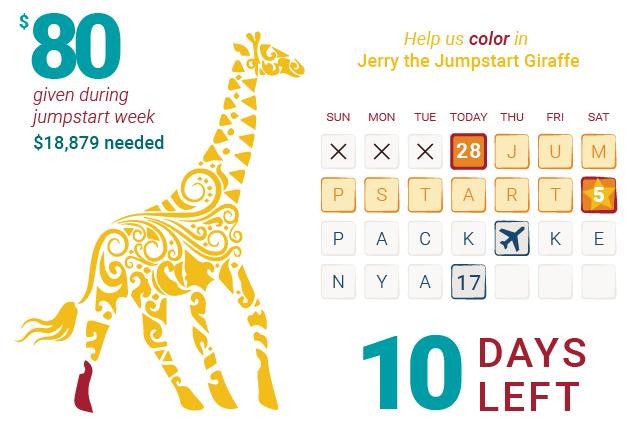 Our ministry needs $18,879 in one-time pledges by January 5 for us to meet our launch goal. Until then, you’ll be getting frequent emails so you can see the fund grow in real time. This is an exciting time and a great opportunity to join us in prayer. We don’t want to clog your inbox, so after January 5 hits, you’ll get our emails at the usual, leisurely pace. January 5? Wow, that’s fast! We’ve seen God work amazingly for other missionaries in similar circumstances. If God wants it, He can make it happen. Our flights to Kenya leave January 12. There’s a major team meeting starting on January 17, so we’ll arrive just in time to meet colleagues from all over Africa. If you’ve ever moved, you know that it’s expensive. It’s even steeper when U-Haul truck won’t do the trick. We still need $18,879 to cover flights across the ocean, furnishing an apartment, language school, and a vehicle. These are just one-time costs; you’ve already generously pledged to provide our sustaining needs. If we don’t get 100% of our launch budget by January 5, we’ll have to postpone our departure and miss this key meeting with our team members. If you might be interested in giving toward these costs, please e-mail or call us directly, and feel free to tell your friends. We’re excited to see what God does through partners like you.